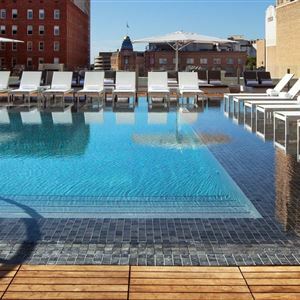 Property Location With a stay at The St. Anthony, A Luxury Collection Hotel, San Antonio, you'll be centrally located in San Antonio, steps from San Antonio Majestic Theater and minutes from Tobin Center for the Performing Arts. This 5-star hotel is within close proximity of Alamo and River Walk. Rooms Make yourself at home in one of the 277 air-conditioned rooms featuring refrigerators and LCD televisions. Your room comes with a pillowtop bed. Cable programming and iPod docking stations are provided for your entertainment, while wireless Internet access (surcharge) keeps you connected. Partially open bathrooms with showers feature designer toiletries and hair dryers. Amenities Enjoy recreational amenities such as an outdoor pool and a fitness center. Additional amenities at this hotel include wireless Internet access (surcharge), concierge services, and wedding services. Dining Satisfy your appetite at one of the hotel's 2 restaurants. Relax with a refreshing drink from a poolside bar or one of the 3 bars/lounges. Business, Other Amenities Featured amenities include a business center, express check-out, and complimentary newspapers in the lobby. This hotel has 14 meeting rooms available for events. 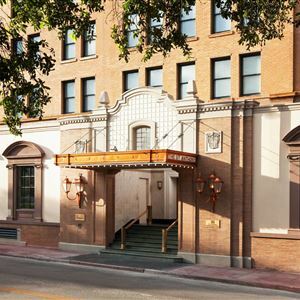 With a stay at The St. Anthony, A Luxury Collection Hotel, San Antonio, you'll be centrally located in San Antonio, steps from San Antonio Majestic Theater and minutes from Tobin Center for the Performing Arts. This 5-star hotel is within close proximity of Alamo and River Walk. Make yourself at home in one of the 277 air-conditioned rooms featuring refrigerators and LCD televisions. Your room comes with a pillowtop bed. Cable programming and iPod docking stations are provided for your entertainment, while wireless Internet access (surcharge) keeps you connected. Partially open bathrooms with showers feature designer toiletries and hair dryers. Enjoy recreational amenities such as an outdoor pool and a fitness center. Additional amenities at this hotel include wireless Internet access (surcharge), concierge services, and wedding services. Satisfy your appetite at one of the hotel's 2 restaurants. Relax with a refreshing drink from a poolside bar or one of the 3 bars/lounges. Featured amenities include a business center, express check-out, and complimentary newspapers in the lobby. This hotel has 14 meeting rooms available for events.